Joan Hogetsu Hoeberichts is a Licensed Social Worker and holds a Master’s Degree in Business Administration. Joan is a full-time psychotherapist with a private practice in New York City and Montclair, New Jersey, USA. Joan helps: families in conflict to find better ways to understand one another and communicate, and couples struggling with their relationship to find their way back to reconnection. She works with depressed or acting out teens and facilitates recovery from early and recent trauma. She reduces stress and anxiety, facilitates personal spiritual journeys, works with artists and writers and coaches executives. 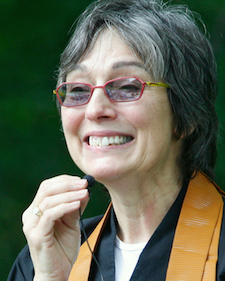 Joan Hogetsu Hoeberichts is the leading Teacher of the Heart Circle Sangha in Ridgewood, New Jersey, USA, and offers ongoing meditation, conducts meditation retreats, teaches Zen workshops, and offers koan study. She is also the co-founder of the Psycho-Spiritual Healing Project, a continuing joint project of the Heart Circle Sangha and Sarvodaya in Sri Lanka to bring counseling skills to local para-professionals following the tsunami of 2004. Joan leads a team of American psychotherapists who travel to Sri Lanka to teach psychotherapeutic counseling skills. Sensei Joan Hogetsu Hoberichts was formerly a business executive.